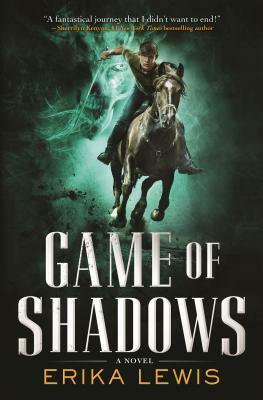 A young man plagued by the ability to see ghosts races to save the mythological land of Tara from a terrible fate in Erika Lewis's stunning debut, Game of Shadows. Thousands of years ago in Ireland, an ancient race fought a world-changing battle—and lost. Their land overrun, the Celtic gods and goddesses fled, while the mythical races and magical druids sailed to an uncharted continent, cloaked so mankind could never find it. This new homeland was named Tara. In modern day Los Angeles, Ethan Makkai struggles with an overprotective mother who never lets him out of her sight, and a terrifying secret: he can see ghosts. Desperate for a taste of freedom, he leaves his apartment by himself for the first time—only to find his life changed forever. After being attacked by dive-bombing birds, he races home to find the place trashed and his mother gone. With the help of a captain from Tara who has been secretly watching the Makkais for a long time, Ethan sets out to save his mother; a journey that leads him to the hidden lands, and straight into the arms of a vicious sorcerer who will stop at nothing until he controls Tara.With new-found allies including Christian, the cousin he never knew he had, and Lily, the sword-slinging healer who’d rather fight than mend bones, Ethan travels an arduous road—dodging imprisonment, battling beasts he thought only existed in nightmares, and accepting help from the beings he’s always sought to avoid: ghosts. This L.A. teen must garner strength from his gift and embrace his destiny if he’s going to save his mother, the fearless girl he’s fallen for, and all the people of Tara. ERIKA LEWIS graduated from Vanderbilt University and went on to earn an Advanced Certificate in Creative Writing from Stony Brook University. She has had a successful career in television production for the past seventeen years, working with Sony (V.I.P, Strong Medicine,) with Fireworks Television (La Femme Nikita, Andromeda, Mutant X, Strange Days at Blake Holsey High,) with Fox (On Air with Ryan Seacrest, Ambush Makeover) and with G4 (Attack of the Show, X-Play.) Lewis is the author of The 49TH Key, published in Heavy Metal Magazine, and Firebrand with Legendary Comics. Game of Shadows is her debut novel.